Stitcher audio streaming app available in App World | BlackBerry Blast! 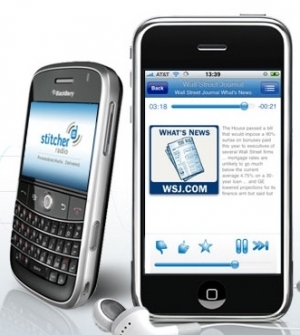 Stitcher announced the release of its on-demand audio application into BlackBerry’s App World. The new app is available free of charge for Curve 8300, 8310, 8320 and Bold 9000 from Research in Motion (RIM). Stitcher’s long-awaited introduction into BlackBerry App World comes roughly nine months after the company released its iPhone app through Apple’s App Store. The iPhone application quickly rose to become one of the most popular apps in the news category and recently won the People’s Voice Webby Award in the Mobile News category. Last month, iPhone users listened to more than a million shows on Stitcher. Stitcher streams on-demand news, audio shows and podcasts to mobile devices without syncing or wires. The company works with top media companies to provide well-rounded, up-to-date content. Stitcher’s wide selection of business and headline news is well-suited for the millions of busy BlackBerry users on the go. Stitcher plans to eventually support all BlackBerry series.